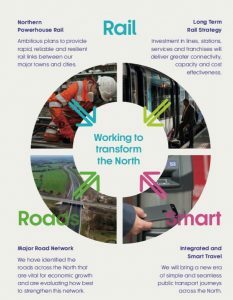 Transport for the North are currently consulting on their Strategic Transport Plan for the north of England with responses due by 17 April. 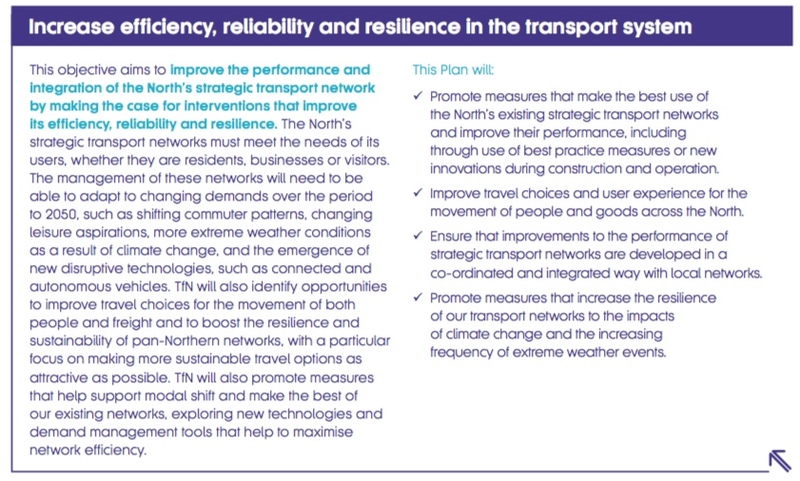 As part of the report TfN have set out a number of key objectives and have also, in a supporting 152 page Roads Report, identified a set of ‘Connectivity Priorities’. 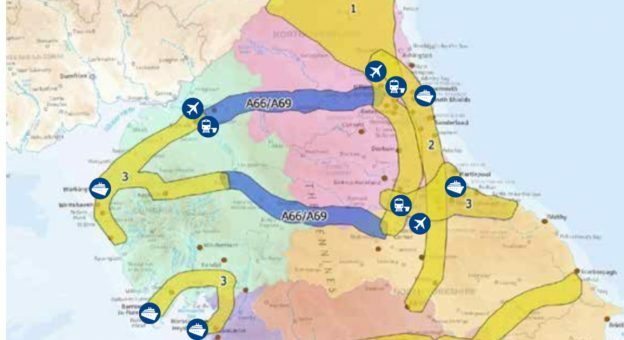 The picture above is from page 86 of that report showing the three road priorities that connect the north east broadly corresponding to existing routes including A1, A19, A66 and A69. 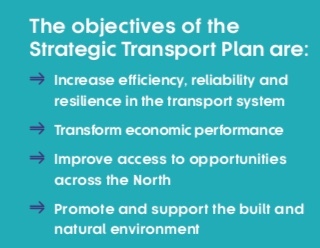 The strategy’s objectives in themselves make broad sense in terms of improving efficiency and economic performance, providing better access to jobs and promoting sustainable travel. The problem comes in linking these to the proposals, as there is little evidence to suggest that these objectives will be achieved by investing in long distance road links. The report The end of the road? Challenging the road-building consensus by the Campaign to Protect Rural England sets out the evidence quite clearly but there are numerous other studies we could point to that make the same case. Even the report that is quoted to support the supposed economic benefits of the investments proposed says “effects on productivity have been found to be non-existent beyond 80 minutes driving time“. The same report, Economic growth and the strategic road network written by the construction company Atkins for Highways England, also states: “The evidence reviewed generally relates to transport investment of all types. Whilst there is less evidence specific to the impacts of investment in roads, the importance of the SRN for business use suggests that the broader evidence would be relevant“. So it seems like the case for spending billions of pounds of road investment rather than other forms of transport is based on what appears to be a hunch, whereas we know for example that the case for investing in active travel is very strong. So why is there practically no mention of walking and cycling in the strategy? We also know we weren’t the only ones that were sceptical on reading the report – this was from Chris Boardman, Cycling and Walking Commissioner for Greater Manchester. Investing in motorways to link cities gets you more cars, pollution, I’ll health, & ultimately congestion. Investing primarily in public transport to link cities reduces all of these and ENABLES local active travel to thrive. The TfN response that walking and cycling is outside their remit doesn’t cut it for us. If there’s a better value more effective way to meet the same objectives then that should be prioritised and funded first. We thought as a first step though, and to be fair to TfN, we should ask to see if they were aware of evidence that we are not that does link long distance road links. We sent the following letter by email on 15 March to TfN with a chase on the TfN Strategy Director Jonathan Spruce on 22 March, but have had no reply. If the evidence does exist then clearly that will guide our response. If not, then we will be asking for a major rethink as the last thing we need in Newcastle is more congestion, pollution and ill health, all as a result of billions of pounds wasted on bigger roads funnelling traffic into our city. Having reviewed the draft Strategic Plan we are broadly supportive of the objectives as set and also of using an evidence-based approach for determining how best to achieve those objectives that also establishes a compelling case for change and ensures the best possible value for money. While we understand the benefits of rail investment in enabling the objectives the plan seems far less clear on how major road investment will best meet the objectives as set out and are wondering if there is some evidence that has been missed from the plan that relates to this? I hope you don’t mind but we’ve listed below where we think those gaps are and if you are able to confirm what the TfN thinking is I’m sure that will be beneficial for ourselves and others who might have a similar concern. Our hope would be to provide a response based on that evidence and share that via our website to inform others who may also wish to response. Have you completed an analysis of efficiency, reliability and resilience of different modes of transport* to determine the relative levels of investment by mode in the plan? By ‘transport mode’ I include driving, national and local rail, bus and coach travel, walking, cycling and air travel. ‘Demand Management’ is mentioned, though very briefly e.g. p54 of the Major Roads Report. What approaches have been considered and have you evidence of their effectiveness? Have you assessed the relative levels of agglomeration benefits if investing in transport within existing agglomeration vs investing in transport between agglomerations? Does the plan include measures to offset or limit the impact of induced traffic that historically has meant road schemes do not result in faster journey times, negating any potential agglomeration benefit? Have you assessed evidence relating to the relative economic impact of investing in different transport modes, especially low-cost modes? Have you assessed risk related to businesses relocating away from northern cities due to better transport links? Have you assessed which transport modes are most accessible and affordable for those on low incomes or with limited mobility to avoid transport poverty? Have you assessed likely journey lengths for those on low incomes or with limited mobility to inform where to focus investment? Have you assessed risk related to employment and services relocating away from residential areas due to improved transport networks? What factors are you considering in order to make ‘sustainable options as attractive as possible’? E.g. cost, safety, time, directness. How will this objective determine the relative level of investment by travel mode? How will increases in carbon emissions and air pollution resulting from increased road travel be offset? How will health impacts of different investment options be taken into account? E.g. lung and heart disease due to poor air quality, illnesses related to inactivity, mental health issues. This entry was posted in Economy, future, Surrounding areas and tagged Access to Opportunities, Efficiency, Natural Environment, Reliability, Resilience, Transport for the North on April 9, 2018 by SPACE for Gosforth. Hundreds of millions of pounds have been spent adding a lane by the Metro Centre, and more again is due to be spent on the A1 bypass by Newcastle. I imagine Highways England would be quite disappointed you hadn’t noticed given the vast amount of taxpayer funds invested in these schemes.